Can you believe it is already May? That means grilling season is just about here! This month, our recipe for Phoenix Public Market is perfect for just that. We’ve come up with some delicious Grilled Cajun Veggie Kabobs! These kabobs are a great side for meat eaters or can be served as an entree for vegans and vegetarians. For this month’s recipe, we were inspired by all of the new summer produce coming into the market. We selected squash and onions from Crooked Sky Farms and tomatoes from Abby Lee Farms. We seasoned it with Cajun seasoning from Carefree Spice Company. The great thing about these veggie kabobs aside from being easy is that they are customizable to your taste. You can add or remove any vegetables you don’t care for. With summer just about here, the produce at Phoenix Public Market is changing! 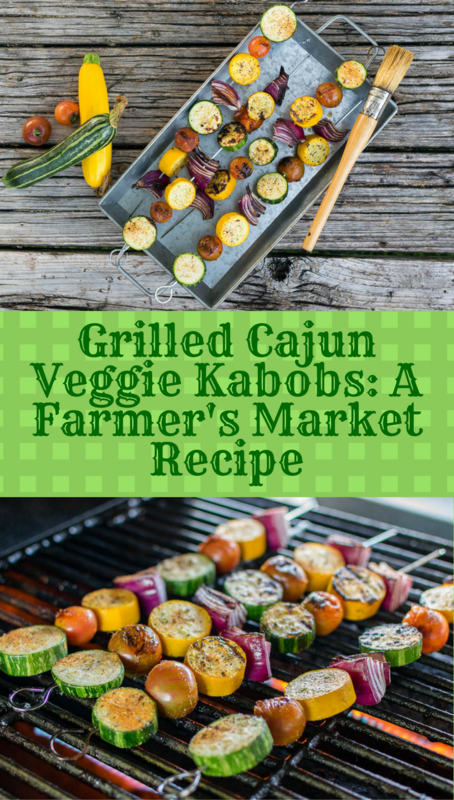 Be sure to visit and check out all of the seasonal goodies while you are picking up the ingredients for our Grilled Cajun Veggie Kabobs. Remember Phoenix Public Market stays open all year! During the summer they have misters and shade as well as earlier hours. This means you can beat the heat and still shop locally! Next month we are planning a chicken recipe you won’t want to miss! 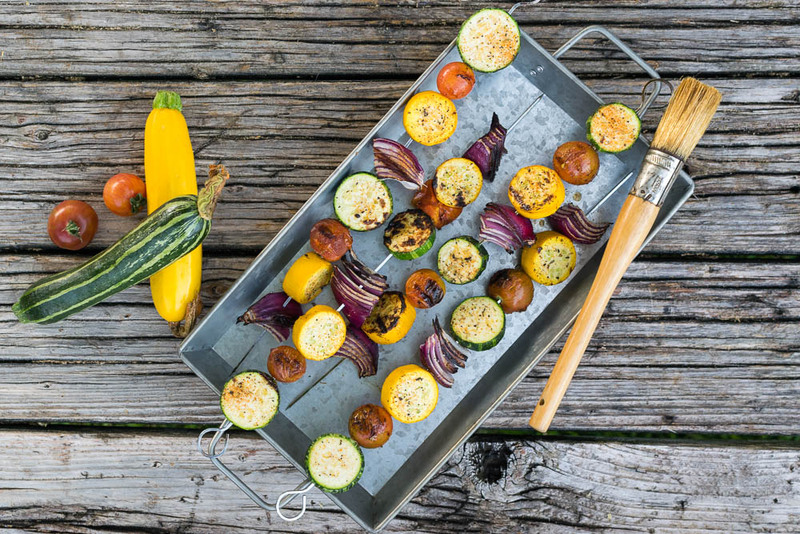 Place cut vegetables on skewers alternating squash, tomato, squash, onion. Brush or spray vegetables with oil/cooking spray. Sprinkle both sides of the skewer with Cajun seasoning. Grill on each side until tender being careful not to burn the vegetables. I am so happy grilling season is here. Also …. it will be nice to visit the markets again. These look delicious and perfect for all the BBQ parties this summer. I love those colors in there! Too often veggies are forgotten at those big BBQ events! 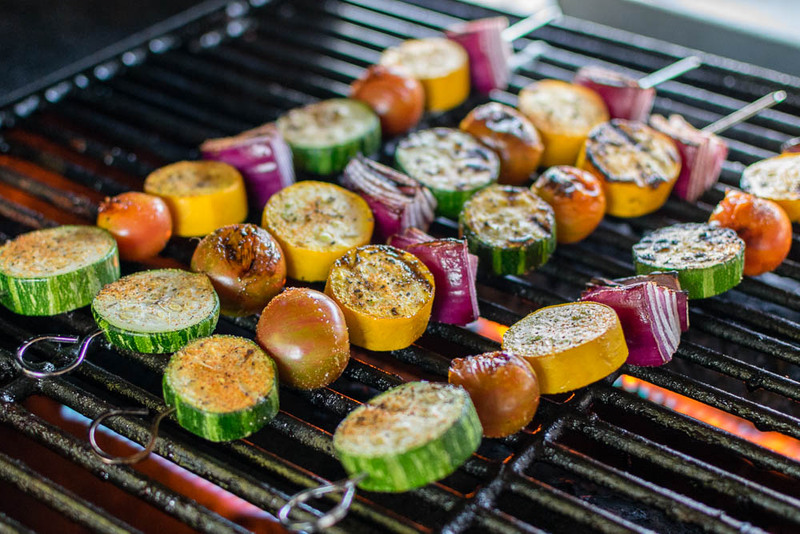 Nothing like a nicely grilled skewer of veggies. Looks yummy and spiced to perfection! Yum! I love the pairing of cajun spices with those veggies. Perfect start to the summer grilling season. I can’t wait for grilling season! These would go over well with the vegetarians in our crew! Cajun seasoning is one of my favorites! And I never thought about trying them with these wonderful veggies, Yum! I promised myself we are going to get a grill this year… I adore smokey flavours and grilling them in the oven is not the same. Your veggie kabobs look amazing! Great idea for treating veggies like a good cut of meat for the grill! Looks terrific. Love cajun seasonings, it makes a perfect combo for veggie kebobs! High Five for grilling season AKA my favorite season! Love all your colors! Wow these look so good! It just screams summer! You’ve inspired me to go to my farmer’s market this week and see what gets me excited to grill!